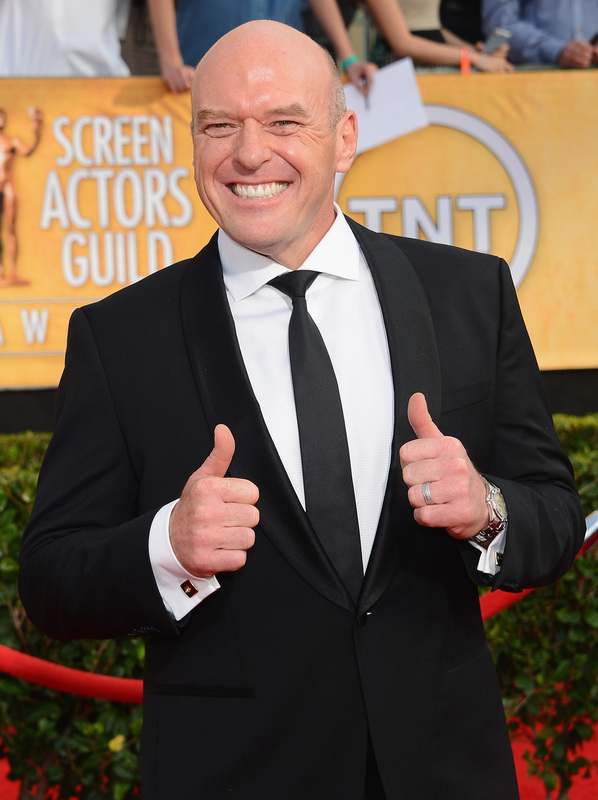 Unfortunately fans probably won't get see Hank Schrader on Better Call Saul because actor Dean Norris isn't a fan of the spinoff. The Breaking Bad star commented on the new series in an interview with ScreenCrush, and he was less than flattering towards the idea. "I have very conflicted views on Better Call Saul," Norris admitted. "You know, I’m such a big fan of Breaking Bad. So, I thought it was the perfect show and I thought it ended perfectly and to just kind of mess with that in any way, what’s the upside?" As a Breaking Bad fan, I understand the concern with doing a prequel, but this isn't just any spinoff. This is a show created and written by the same people who brought us the magic of Walter White and Jesse Pinkman. It has original actors, writers, creator, and producers returning. This isn't a straight-to-DVD movie sequel with a whole new cast and crew. And I have a hard time believing Vince Gilligan would create a spinoff if he didn't believe in it. If he just wanted the money or whatever he could have kept writing for Breaking Bad instead of ending it in Season 5. It's odd to me that Norris doesn't trust the people who launched his career into the public eye. Before Breaking Bad, Norris played a bunch of bit roles for years. Post-BB he's hit it big, and is now one of that stars of Under the Dome. He needs to take Aaron Paul's attitude who said after learning of Better Call Saul that he'd be there in a heartbeat if asked. "Anything Vince [Gilligan] is involved with, I’m there. I owe him my entire career," Paul said in February. Maybe, years down the line, maybe I’ll show up on that show. But, I’m afraid ... Maybe a few years down the line, once that show gets established and has its own rhythm, maybe then something comes up. But, it certainly wouldn’t be for a long time. If ever. How many times can one person use the word "maybe" in an answer? I seriously doubt Norris will ever appear on Better Call Saul with a response like that. Walter White would not approve. But maybe that's a good thing. If he doesn't trust creators Peter Gould and Vince Gilligan despite the fact that they worked magic with the multi-Emmy winning Breaking Bad, then maybe we don't want him in the spinoff. That show deserves for its actors to believe in it and want to be there. Fortunately for the show and for us, Breaking Bad's Bob Odenkirk, Jonathan Banks, and the like are more than willing to appear in the series—and that's good enough for me.